Looking north on Fifth Avenue from 33rd Street, around 1905-1920. Image courtesy of the Library of Congress, Detroit Publishing Company Collection. Notice the extremely wide sidewalks in the first photo. 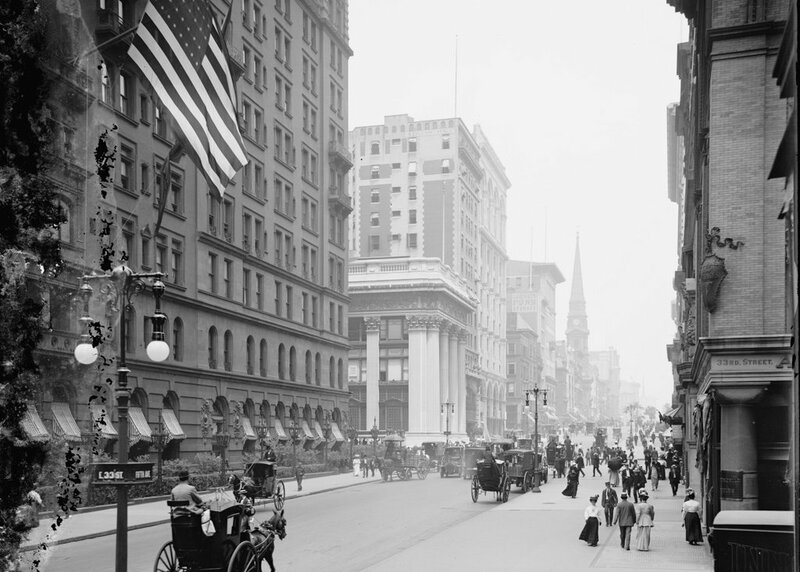 Fifth Avenue was originally designed to have a 40-foot roadway with 30-foot sidewalks on either side, but this changed in 1908, shortly after the first photo was taken. To accommodate the growing automobile traffic on the street, it was widened to 55 feet, and the wide sidewalks were trimmed down. 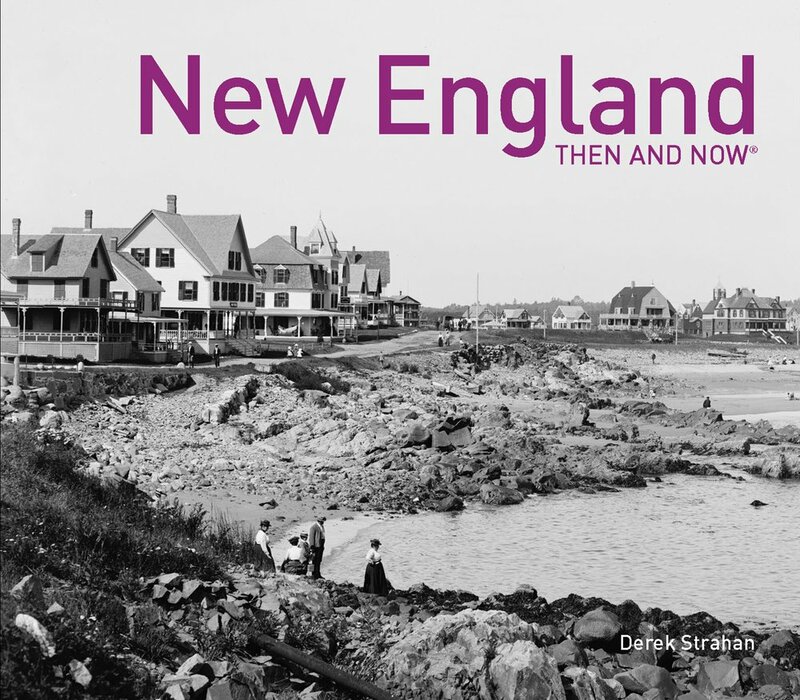 Despite over a century of change, though, there are a remarkable number of buildings that have survived from the first photo, especially on the left side. 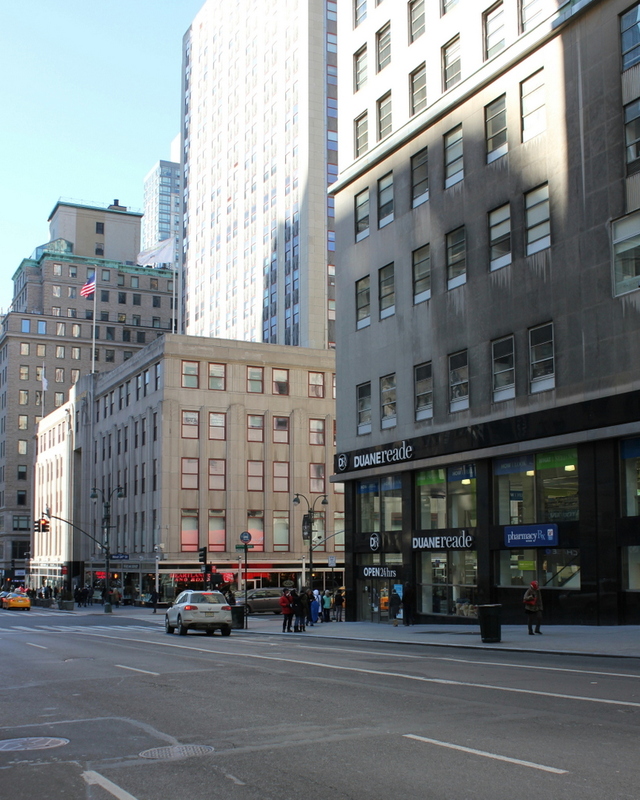 When the first photo was taken, this section of Fifth Avenue had just recently become a major commercial area, and as a result most of the buildings were new at the time. 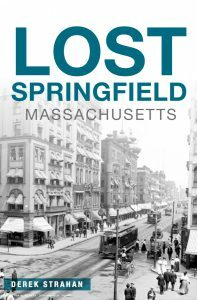 Perhaps most surprising from the first photo is that the Knickerbocker Trust Company Building – the short building with columns in the center of the photo – is technically still standing, although it has long since been altered way beyond recognition. 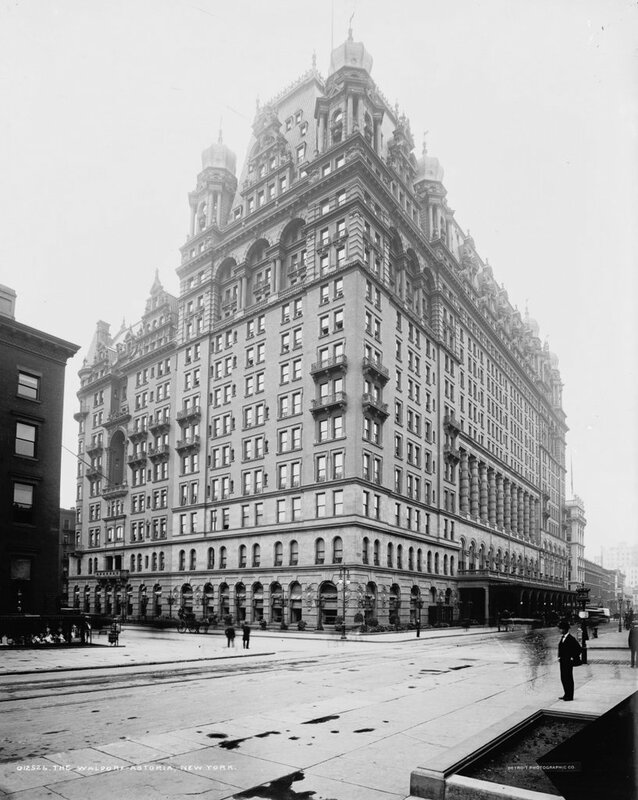 It was built in 1904 at the corner of Fifth Avenue and 34th Street as the headquarters of one of the nation’s largest banks, but soon after the bank inadvertently played a major role in causing the Panic of 1907. 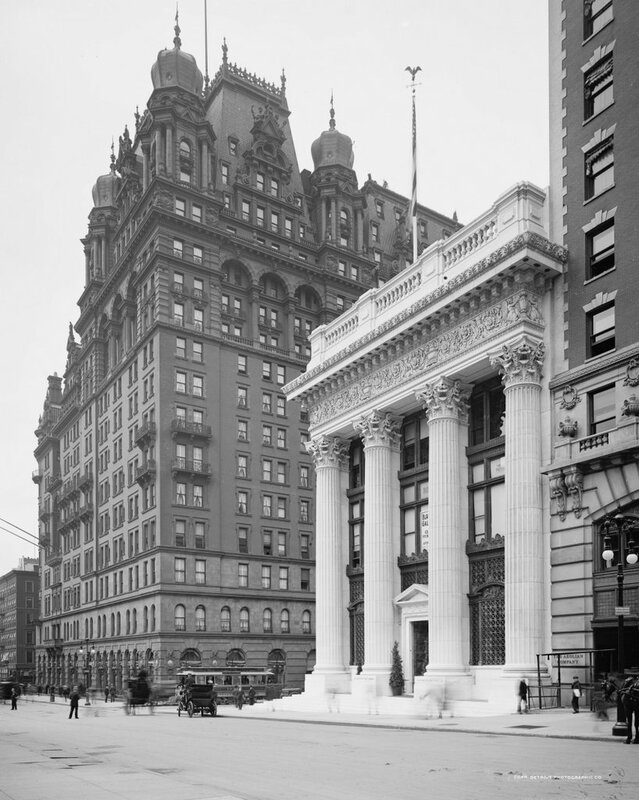 This banking crisis occurred around the time that the first photo was taken, after the Knickerbocker president, Charles T. Barney, attempted to corner the market in copper using the bank’s money. The plan failed, and in the days before FDIC-insured deposits, account holders rushed to the bank to withdraw their money as other banks announced that they would no longer accept checks from Knickerbocker accounts. Ultimately, the bank survived, although Barney was forced to resign and he committed suicide soon after. 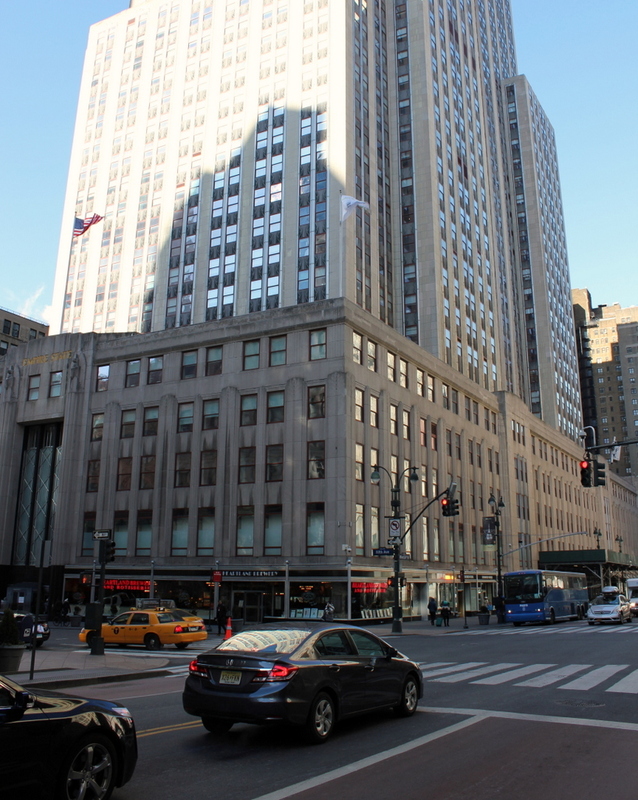 As for the building, it was significantly changed in 1921 with the addition of ten stories on top of it, and in 1958 the facade was altered to its current appearance, removing any exterior elements from the original structure. Despite the number of surviving buildings from the first photo, there are several notable ones that have since been demolished. In the distance, at the corner of 37th Street, is the steeple of Brick Presbyterian Church, which was built in 1858 when this area was still largely residential, and it stood there until 1937. Probably the most famous building from the first photo, though, is the Waldorf-Astoria Hotel, on the left side in between 33rd and 34th Streets. This massive hotel is only partially visible in this view, and it stood here until 1929, when it was demolished to build the Empire State Building, which now stands on the site. 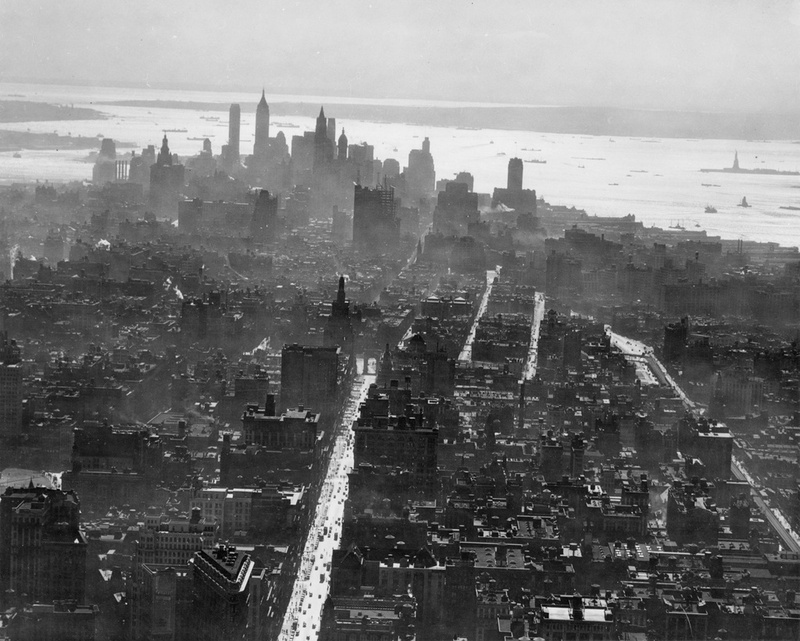 The view looking north toward Central Park from the Empire State Building on September 11, 1933. Photo courtesy of the Library of Congress, Gottscho-Schleisner Collection. 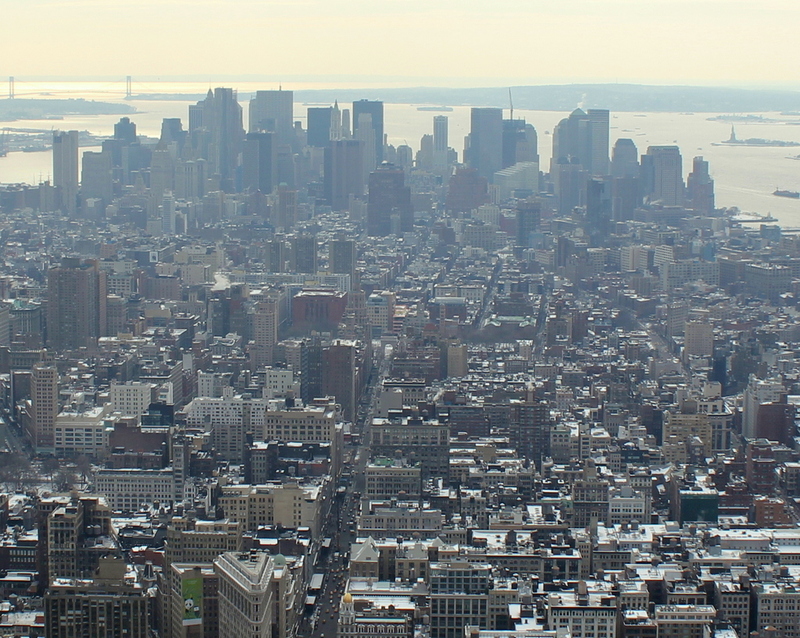 When the Empire State Building was completed in 1931, it stood far above any of its Midtown neighbors. However, in the past 80 years the other buildings between the Empire State Building and Central Park have begun creeping upward. The Empire State Building was still the tallest when the 2011 photo was taken, but the skyscrapers are noticeably taller. The Rockefeller Center, which blocks out part of the view of Central Park in the 1933 photo, stands out in the first photo, but now the 70-story building seems to blend in with its surroundings. 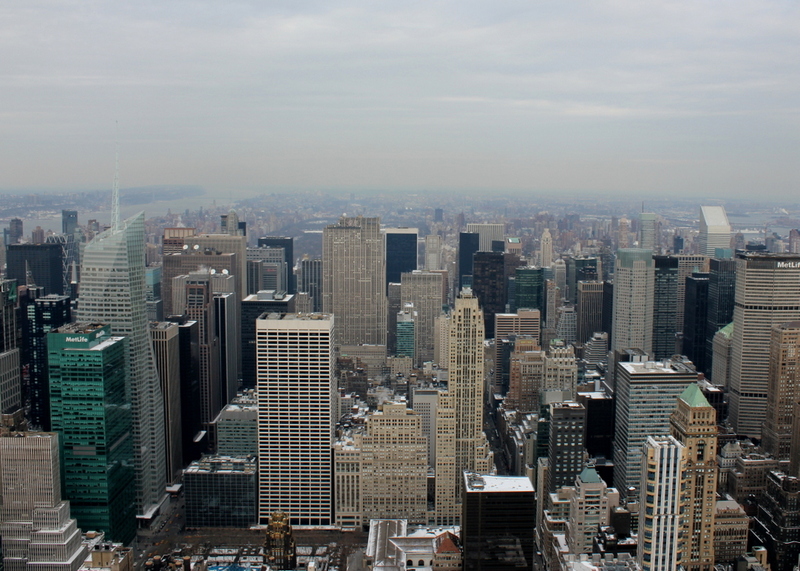 Today, the Empire State Building is no longer the tallest in the city, or even in Midtown – it has since been displaced by 432 Park Avenue, with two even taller residential skyscrapers on West 57th Street in the works. 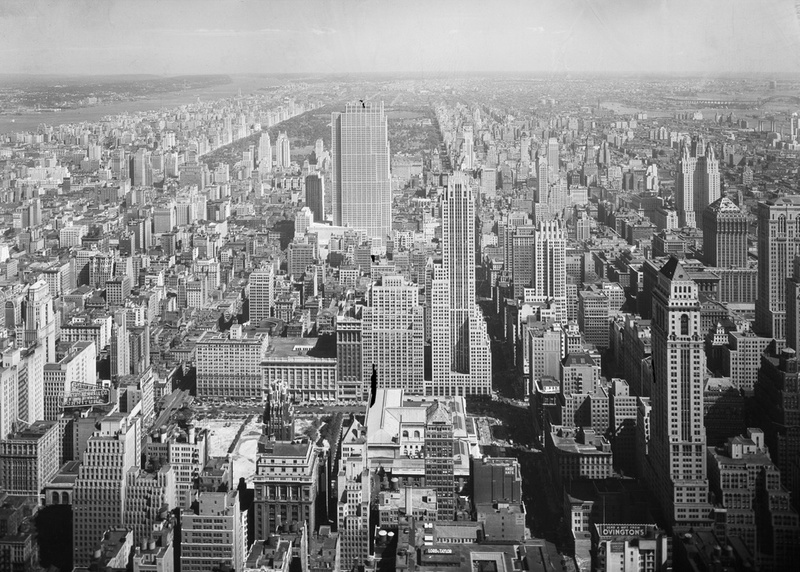 The view looking south from the Empire State Building around 1931. Photo courtesy of the Library of Congress. For all of the changes that have taken place in New York City over the past 80 years, these two photos really don’t look all that different. The buildings in lower Manhattan have certainly become taller, but even many of the skyscrapers from the 1931 photo are still there. 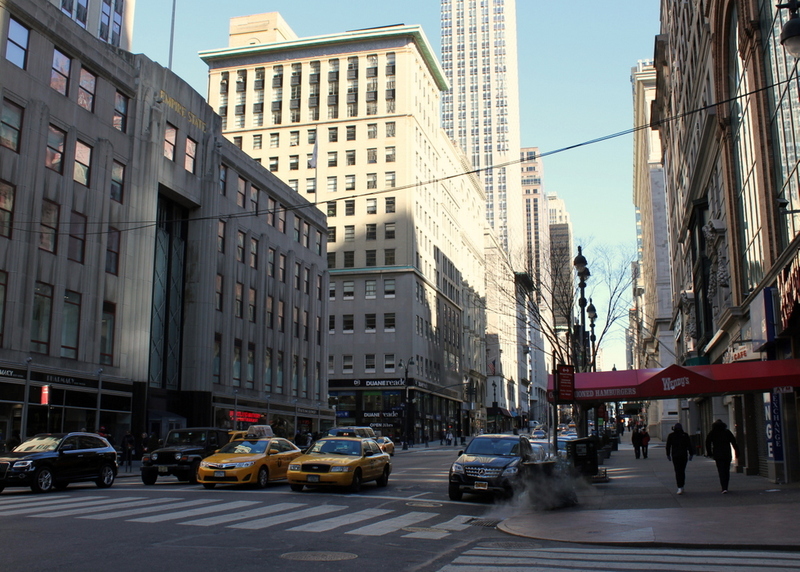 In the center foreground, many of the buildings along Fifth Avenue are still there, including the Flatiron Building, which was old even when the first photo was taken. The Statue of Liberty is still there on the right in the distance, although the far left side has one major change: the Verrazano-Narrows Bridge connecting Brooklyn and Staten Island. 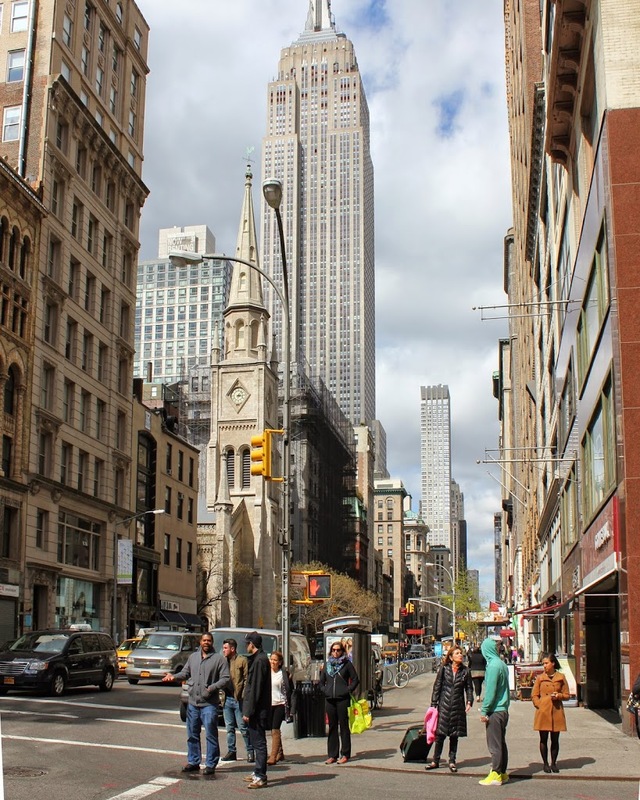 Both views give an idea of the massive scale of the Empire State Building; the first was taken around the time the building was completed, and it towered over everything else in Midtown – even the 21-story Flatiron Building looks diminutive when viewed from here. When the second photo was taken in 2011, the Empire State Building was still the tallest in the city, although it had been surpassed by both World Trade Center towers from 1972 to 2001, and in 2013 it would again be surpassed by the new World Trade Center building, which is visible under construction in this 2011 view. The view looking north on Fifth Avenue from 28th Street, around 1905. Image courtesy of the Library of Congress, Detroit Publishing Company Collection. Despite it being over 100 years since the first photo was taken, many of the buildings along Fifth Avenue are still there. 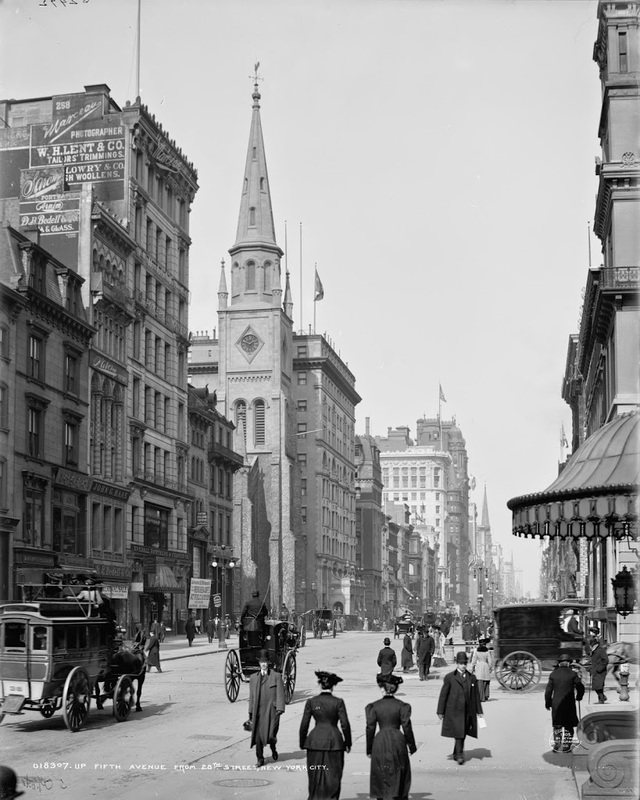 In particular, Marble Collegiate Church in the left-center of the photos appears almost unchanged; it was built in 1854, back when Fifth Avenue looked far different from either of these two photos, and it is home to the third oldest church congregations in the United States, having been founded in 1637. A few other buildings are also identifiable from both photos, including the tall building to the left of the church, although at some point in between someone added four stories to it, with little regard for making it match the rest of the building. The most notable difference, of course, is the Empire State Building, which would not be completed until about 25 years after the first photo was taken.